ADOPTED: Gino, 4 year old Terrier Mix. CGC Certified Family Pet. 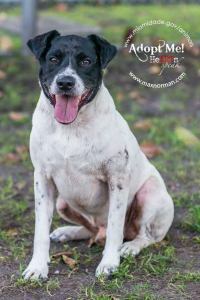 Gino is available for adoption through Miami Dade Services (MDAS). He is a graduate of the Second Chance Dog Training Program, a partnership between MDAS, Applause Your Paws, and Miami Dade County Corrections. Gino is 4 years old and currently lives at the “Stockade,” a Jail in Miami Dade-County. Gino and his inmate handler earned their AKC Canine Good Citizen title and training under the instruction of Dee Hoult, Head Trainer of Applause Your Paws Inc. Gino is a spirited adult dog who loves to play with other dogs but also knows how to relax. There’s nothing he loves more than to be scratched on his chest, petted and or given belly rubs by his person. Gino’s ideal home is an adult home where he can have a yard to play, or go on daily walks with his person. As a Canine Good Citizen he can sit, down, stay, come, leave it, go to place, heel, sit politely for petting and accepts grooming and touch all over. Gino is an excellent watch dog! Although non aggressive he definitely lets you know when there is someone approaching home-base. His alert bark quickly turns to tail wags. Adopt Gino! Gino’s inmate trainer named him Gino in honor of a black and white border collie he once knew that had excellent manners.